Most of these three-inch 1911s come in either 9mm or .45 ACP, sacrificing nothing in stopping power in these perfect pocket-carry pistols. The slides are made of stainless steel and come with two different types of sights: white, three-dot and fixed low-profile three-dot tritium for great target acquisition without snagging on clothes. They all come with an aluminum, match grade trigger (varying cosmetically) with a 4-5 lbs trigger pull. All of Kimber’s 3-inch 1911s are 4.75 inches in height, by 1.28 in width, and an overall length of 6.8 inches. With an empty magazine, the pistols are a light, 25 ounces. This means that any of Kimber’s different series’ would be perfect for pocket carry and would make for a deep concealed IWB pistol. Our Kydex Kimber 3-inch 1911 concealed carry holsters are perfect for this. They all, also, have aluminum frames and are finished in a plethora of colors with a diverse selection of grips. They also come with beveled magazine wells to increase reloading speed. Some of these 1911s have an ambidextrous thumb safety, where others are specific to either right or left handed. No matter which 1911 piques your interest—the Stainless II series, the Crimson Carry II, the Raptor II series—Kimber’s 1911 Ultra 3-inch pistols are some of the best concealed carry pistols on the market. Each can be further customized with accessories or parts such as Kimber’s recoil springs or spring assemblies. 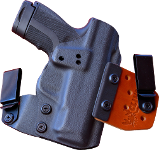 Browse our Kimber 1911 holsters above.